If your morning cup of joe tastes a little funky, it might be time to clean the coffee machine. Here's how to clean a Keurig. 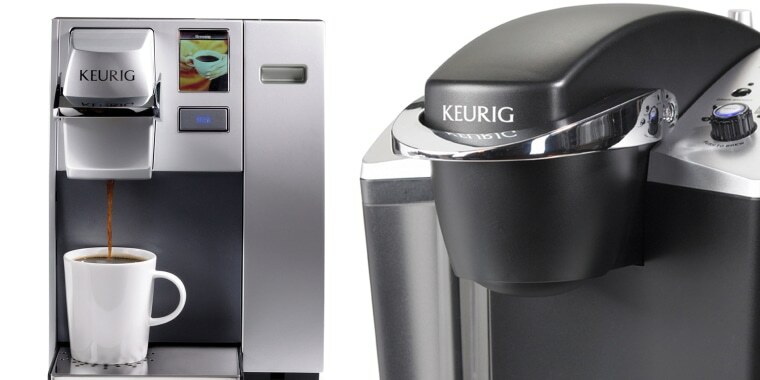 If you love the ease of a Keurig coffee machine, here's the best way to clean it.Keurig Green Mountain, Inc.
There’s nothing like that first cup of coffee in the morning, but it can be seriously tainted if it's coming out of a dirty coffee machine. If your cup of joe is coming from a Keurig, we have all the details you need to know on how to show that coffee machine a little TLC. We asked Allison McManus, associate product manager for Keurig brewers, and Kamaal Jarrett, associate product manager for Keurig accessories, the right way to clean Keurig machines. Here are their easy-to-follow tips. When: Once a week or as needed. How: Wipe the outside of the brewer with a damp, lint-free cloth. How: Below are the steps you need to know. Remove the cold water reservoir from the brewer. Take off the lid and empty the reservoir. Wash the inside of the reservoir using warm, soapy water and a soft, clean cloth. Never wipe the inside of the reservoir with a dry cloth; lint or other particles may cling to the sides of the reservoir and eventually end up in your beverage. Rinse well and dry only the outside of the reservoir. Replace reservoir and run two hot water cleansing brews before using. For more information on cleansing brews, check the product "Use & Care Guide." Remove and empty drip tray. Dry with a soft, clean cloth. How: Below are the steps you need to know! Remove the pod holder following instructions for your type Keurig brewer. Be careful of the needle that punctures the pod. Rinse using only warm water. Do not dry. Replace and run two hot water cleansing brews before using. When: Every 3-6 months, or when day-to-day brewing becomes slower. How: Process varies from model to model, so follow manufacturer’s instructions. This important maintenance chore removes mineral build-up and scaling that can affect the performance of the brewer as well as the taste of the beverage. When: Every two months, or when indicated by the maintenance alert on the brewer. This is necessary even if you use only distilled or spring water. This article was originally published on June 13, 2016 on TODAY.